position during a coast tour. It offers more than the standards of excellence expected of a 5-star hotel: good service and Spa, care detail and a modern and fresh style. 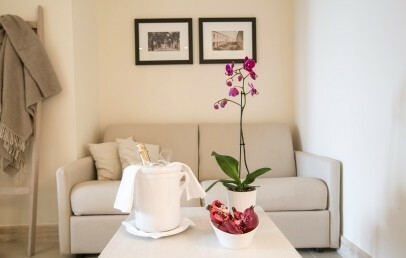 Canne Bianche_Lifestyle Hotel is ideal for couples, families and solo travelers. 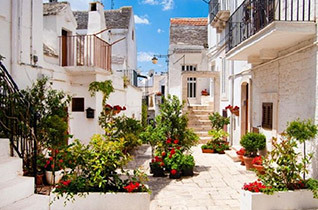 Surrounded by the typical colours and fascinating atmosphere of the Meditteranean, the Canne Bianche_Lifestyle Hotel is located in Torre Canne di Fasano, a beautiful seaside destination in Brindisi Province. Nestled in an reserved area, it is only 60 meters far away from the sea. Canne Bianche_Lifestyle Hotel is a 5-star Spa Hotel, an elegant retreat characterized by white colour and furnished in eco-chic style. Recently restored, it offers a warm and friendly setting, comfortable rooms and common areas and an open door swimming pool nested in the garden. The hotel offers different room typologies, all characterized by care details and elegant furniture which blends harmoniously with technologies and the several facilities. The Wi-Fi internet connection is available complimentary in each room. 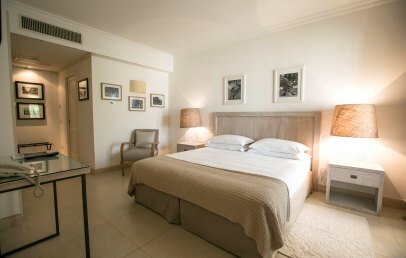 All rooms have a memory foam mattresses and offer the maximum of the comfort. 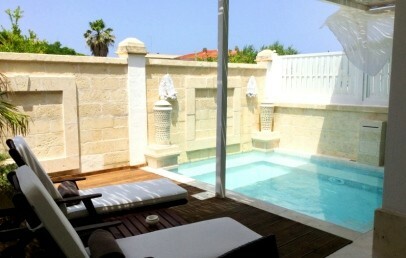 Classic – 20-23 sq.m., ground or first floor, tiny balcony or private patio, bathroom with whirlpool or shower. Superior – 22-24 sq.m. 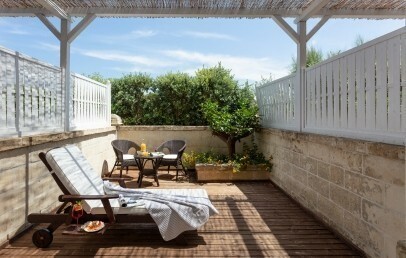 on the first floor, tiny balcony with view on the seaside, bathroom with whirlpool or shower. Junior Suite lateral sea view – 27-32 sq.m., located first floor, bedroom with a living corner or a separate living room, balcony with lateral sea view, bathroom with whirlpool or shower. Junior Suite pool and sea view – 35-38 sq.m., located first floor, spacious bedroom with a living corner, bathroom with whirlpool or shower, private balcony with loungers and magnific view over the sea. Canne Bianche Master Suite – 42 sq.m., located on the ground floor, bedroom with living corner and sofa bed, bathroom with whirlpool and shower, private patio with mini pool. The Wellness "Aqua" Spa has a saunas, steam room, hydro massage waterfall, emotional showers, and Jacuzzi. The Spa menu includes a list of massages and beauty treatments customized to meet your needs. There is also a fitness room equipped by Technogym machines. Daily free entrance (60 minutes) per adult (18 y. and older) which includes the access to the gym and wet-zone, reservation is required. The hotel has a pool service with one sun umbrella per room and one lounger and beach towel per person per day. The loungers and umbrellas are located around the pool, on the lawn or on the sandy area within the property. The hotel does not have a private beach, but allows a direct access to the shoreline, just a few steps away. 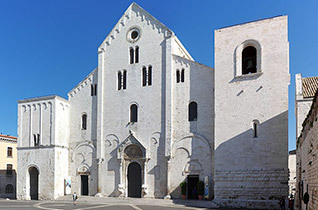 The gastronomic offer is based on classic dishes of the Mediterranean and Apulian tradition, so that guests can taste the high-quality and authenticity flavours. The Restaurant T_imo enjoys a beautiful location between the blue sea and the countryside. It offers an “à-la-carte-menu” and it’s always open for breakfast and dinner and, in low season and in case of bed weather, for lunch as well. In high season (from June to September) lunch is served at the Restaurant A_neto, located by the pool. It offers light lunches and fresh fish dishes. In the lobby is the bar Cumino that awaits the guest also for aperitifs or after dinner drinks. 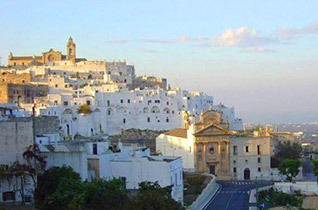 From June to September once a week there is a theme evening "Apulian Buffet Dinner". The half board formula does not include the theme night. Guests not interested in the theme night, may change dinner (only with HB formula) for lunch (only the same day). 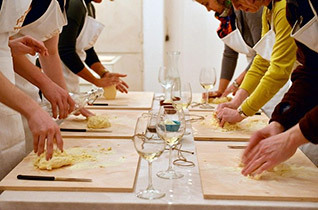 Upon request the Canne Bianche_Lifestyle Hotel is happy to provide additional service: cooking and Italian language classes, bike rental, baby sitting, boat trip and octopus fishing. Nearby it is possible to practice golf, tennis (8 km), football (8 km), horse riding (2 km) and wind surf. 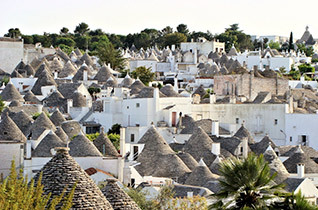 Tourist tax – The municipality of Fasano requires the payment of a tourist tax, that has to be paid on spot during the check-out and children under 12 years are exempted. 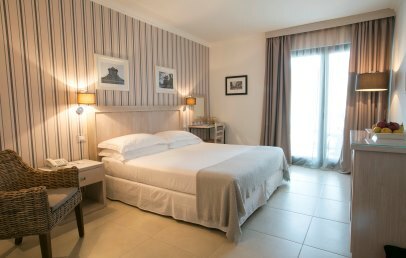 During the months April, May, June, September and October the tax is € 2,50 per person per night, for a maximum of 3 consecutive nights. During July and August the tax is € 4,00 per person per night, for a maximum of 5 consecutive nights. The tax may be subject to any variation without any prior notice. Double room located in the ground or first floor. It is characterized by an eco-chic style which blends harmoniously with technologies and the several facilities. The marble en-suite bathroom provides a walk-in shower with large showerhead or whirlpool-tub. The rooms have a small balcony or a private patio equipped with comfortable sun chairs. On request it is possible to add a baby bed. Comfortable double room located on the first floor. It is characterized by an eco-chic style which blends harmoniously with technologies and the several facilities. The marble en-suite bathroom provides a walk-in shower with a rainfall showerhead or a whirlpool tub. 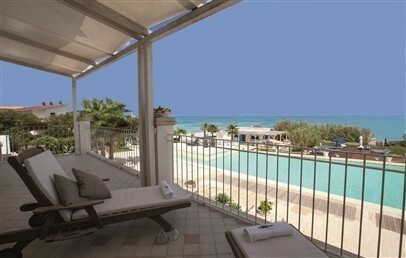 The rooms have a private, equipped balcony with partial sea view. Spacious and light full Junior Suite located on the first floor. It is characterized by an eco-chic style which blends harmoniously with technologies and the several facilities. Some of them have two separate areas where the living area is equipped with a sofa bed, while others have a unique setting with a double bed or separate beds. 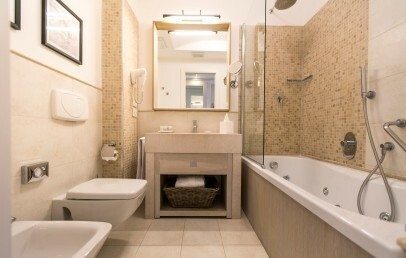 The bathroom is made of prestige Italian marble and has a walk-in shower with rainfall showerhead or a whirlpool-tub. 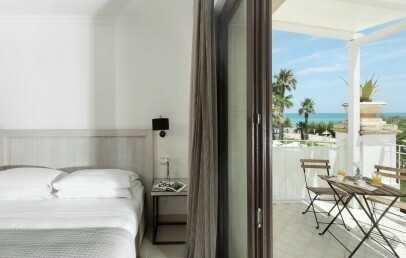 The Junior Suite have an equipped balcony with lateral sea view. 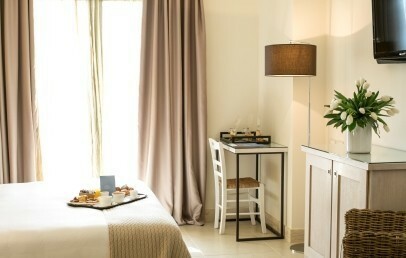 Spacious and light full Junior Suite located on the first floor. It is characterized by an eco-chic style which blends harmoniously with technologies and the several facilities. 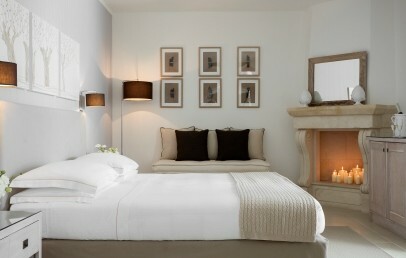 It is an open space Junior Suite with double bed or twin beds. The large bathroom is made of prestige Italian marble and offers a walk-in shower. 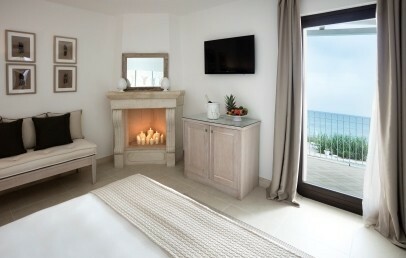 The Junior Suite has an equipped balcony with beautiful sea view and view on the swimming pool. 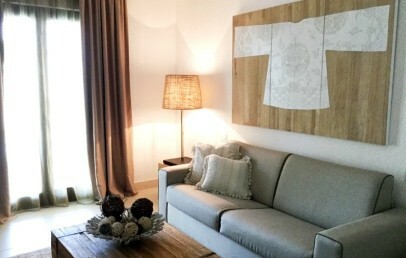 Spacious Suite located on the ground floor. It is characterized by an eco-chic style which blends harmoniously with technologies and the several facilities. It has a bedroom with living area with a sofa bed. The bathroom offers a whirlpool-tub and a shower. The Master Suite has an exclusive outdoor area with a private heated mini pool. Located on the ground floor with a private patio and a heated outdoor Jacuzzi, they consist in a unique space with a king-size bed or twin beds. The bathrooms are made of fine Italian marble equipped with a walk-in shower or a bathtub with rain showerhead.